We're back with more great anthropomorphic animal pewter miniatures - and our full Alpha test skirmish rules free for you to download. 219 backers pledged £15,364 to help bring this project to life. We love miniatures. We love tabletop games. We love anthropomorphic animals, from Disney's Robin Hood to Brian Jaques' Redwall books. So we are combining the things we love in our Burrows & Badgers range of pewter miniatures. Why are we making them? Basically, because we want them! And we know a lot of other people want great anthropomorphic animal miniatures too. Some will want to use them for wargaming or roleplaying. That's what we do with ours - and there's a link below to a free .pdf copy of the Burrows & Badgers Skirmish Game rules for you to download, if you feel like trying it out. And some people just love collecting miniatures; again, we've made this new set of Burrows & Badgers figures perfect for collectors. They are all single piece models, with integral bases, so there are no fiddly parts to be glued on. Just high quality, beautifully cast pewter miniatures. We love making miniatures; we hope you'll love our miniatures too. We've got 26 new figures and 10 terrain pieces sculpted, but they need to have moulds made before we can start producing the miniatures. And that's why we need funding; to get the moulds made, and get the casting process started. There have been other ranges of anthropomorphic animal miniatures made before, but ours are a little different. We didn't want all the races of animals to be the same size. Instead, we've scaled them to each other; so a shrew or a mouse is a very small model, about 20mm tall, and a really big animal like a badger will stand about 50mm tall, for example. Each sculpted figure shown below has a scale picture with it, showing its height in millimetres. All our models are supplied unpainted. Below you'll see pictures of all the different pledges. Each picture shows you what's included in the pledge, then below them you can see close-up pictures of the individual miniatures. If you click on the 'Pick'n'Mix' pledge, it should open an image showing all the individual prices for the miniatures. There's also a Completionist 'Get all the minis' pledge which gets you the 26 sculpts shown below, and saves you £28 over the retail prices. Also, if you missed our first Burrows & Badgers project, or just want some more of those miniatures, you can add them to any of the pledges. There's a price list right at the bottom of the page for you to pick from. All pledges are set for an estimated delivery of March 2016, but to be honest, we expect to deliver a lot sooner than that. We shipped our last project two months early. The biggest risk with metal miniature production is that the figure won't mould and cast correctly - this risk can be reduced by using the correct sculpting materials, by careful planning, and by having a good mouldmaker. The guy we work with - Peter Brown - has 30-odd years' experience, and is just fantastic at his job. Excellent mouldmaker, excellent caster. So we don't expect any problems on that side of things. Another risk is success - if we get more backers than we expect, then we could end up taking a longer time to deliver - there are only 2 of us to handle all the sorting, packing, and posting. But we have set the 'expected delivery date' as March 2016 to allow for this. We actually hope to be beginning delivery earlier; all 6 of our previous projects delivered early. Other than that, we don't expect any major problems. This is our seventh project, so we've already faced most of the possible issues, and figured out how to deal with them. But I'm sure there'll be something we haven't thought of! Pick'n'Mix Pledge; choose whichever miniatures you like from the project, and pay the retail price for them. Completionist Pledge; Includes every pewter miniature produced in this project - which will be at least 25, and maybe more... (See project page for images). 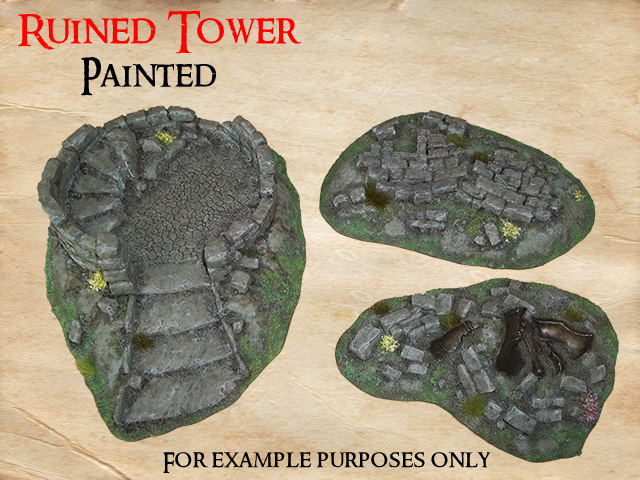 Does not include the Ruined Tower resin terrain.